As a journalist, Naoki Mabuchi has seen quite a bit of actions and the world. Perhaps he has seen that much to have been affected and drawn into its quagmire and finds it hard to leave. He was wounded twice on the battle field. One of the only two movie cameramen to document the triumphant entry of the Khmer Rouge into Phnom Penh in April 1975, he was among the last of the foreigners to leave Kampuchea, escorted out by the Khmer Rouge through Aranyaprathet. He was the only Asian journalist among a score of foreign newsmen taking refuge inside the French Embassy in Phnom Penh in April 1975. 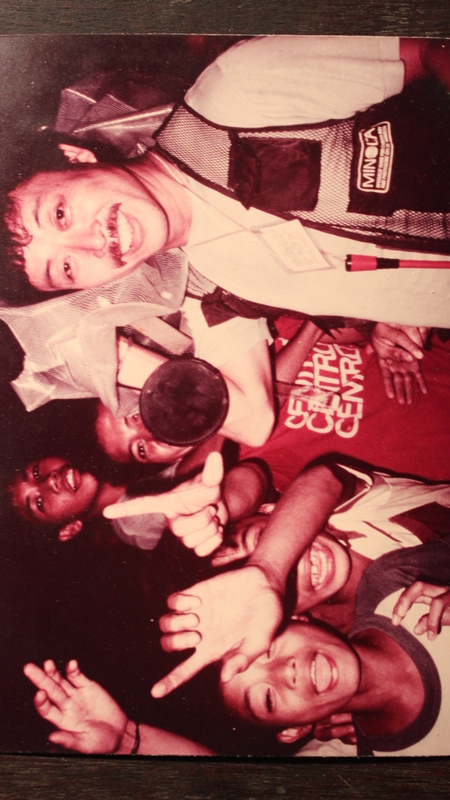 He became well known, at least in Japan, for his rare coverage of news in Kampuchea. 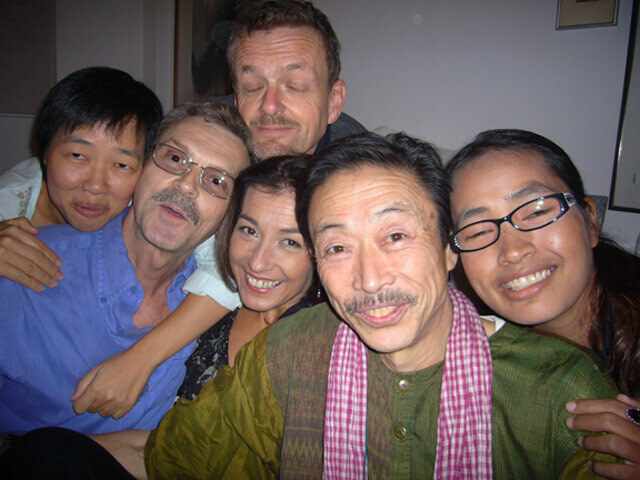 While in the French Embassy in Phnom Penh, Naoki was accused by many western journalists of being a member of the Japanese Red Army because he dared to venture out into the city daily to talk to the Khmer Rouge soldiers and the people. 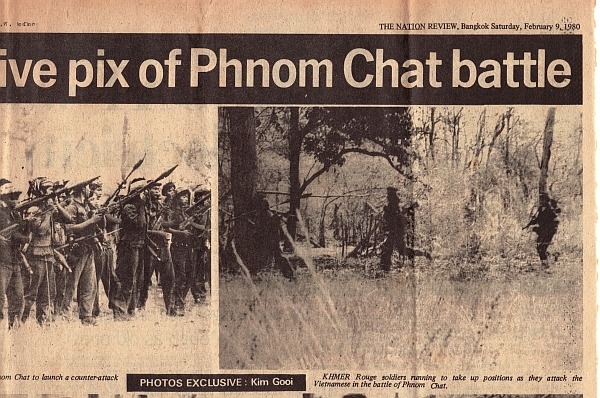 “I was shocked by the accusation by such prominent journalists; [among them Sydney Shamberg of New York Times and British journalist Jon Swain] just because I did not cower in fear like them, thinking that the Khmer Rouge soldiers would kill me, they (the journalists) would not accept me as normal. I must be a Red Army member,” says Naoki. “The truth is that not even one journalist or foreigner was harmed at all though there were many among them who were CIA people.” Naoki says the journalists even confiscated his camera in the embassy, which was another shock to him. 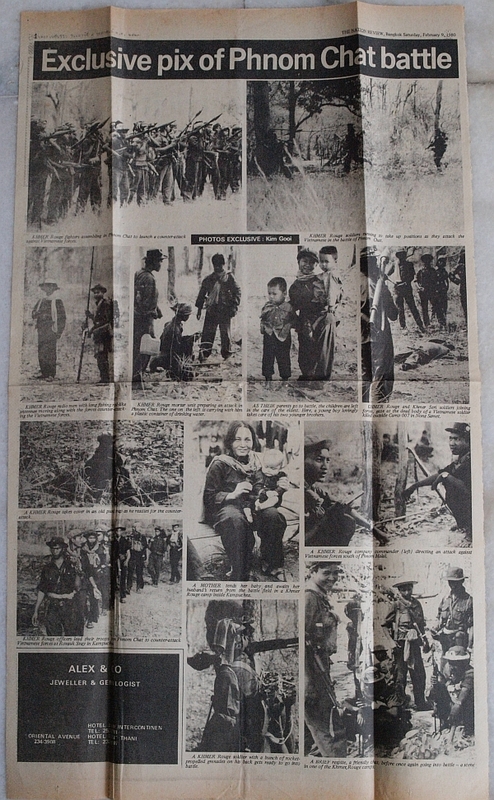 Naoki tried to stay behind with his Khmer wife, Sayhong, to cover the Kampuchean revolution. He was told by the authorities that he had to leave. they had no time to take care of foreign guests. During the detention, stories were written that Naoki was tortured and that his head was shaven bald. All the stories were untrue. A local newspaper in Bangkok also accused him of being a Red Army member. Through all these experiences, Naoki feels very strongly that the Kampuchean story has been greatly distorted and exaggerated due to prejudice and hypocrisy on the part of many journalists. “When I was detained in Poipet, the authorities understood my reason for coming to Kampuchea and forwarded my request to Phnom Penh but the government said no; not this time, I should come through the proper diplomatic channel,” says Naoki. 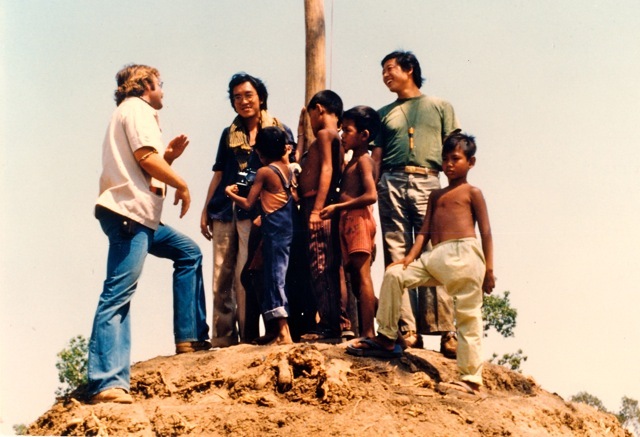 At the beginning 0f 1979, Naoki went to Aranyaprathet to cover the Vietnamese invasion of Kampuchea. Since then he has never been far from the actions, small and big. From June 1979 Naoki started working for ABC News as their resident cameraman in Thailand. 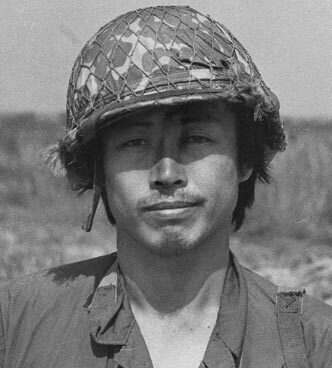 the highlight: Covering the Vietnamese incursion at Non Mak Moon in July 1980, Naoki was right in the front amid the exploding bombs and shells. He was the one who filmed the dramatic downing of a Thai helicopter gunship and an L19 spotter plane by Vietnamese gunners. Naoki interviewed Pol Pot in December 1979 after his resignation as prime minister of the Democratic Kampuchea government. he is one of the few newsmen who had talked to all the top leaders of the Khmer Rouge. 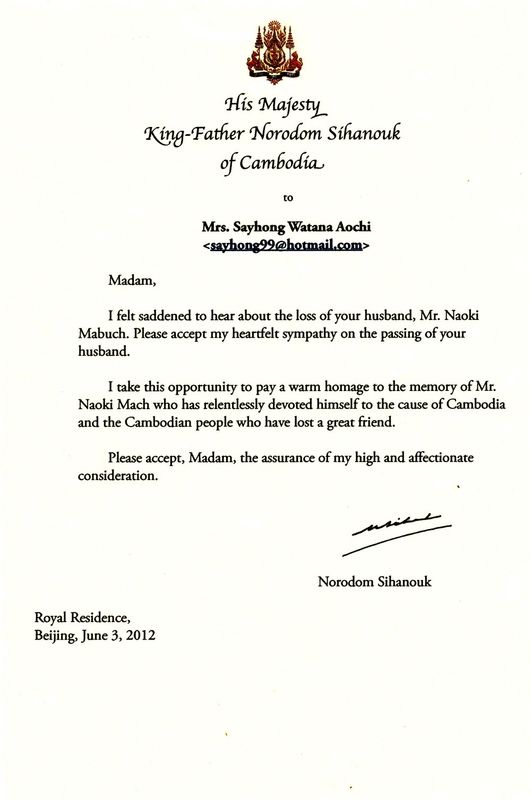 Naoki today remains thoroughly committed to the Khmer people and their aspirations. he has been inside Kampuchea many times, coordinating non-governmental aid to the three factions of the anti-Vietnamese coalition forces. Last year he spent ten weeks trekking with Khmer Rouge forces to Tonle Sap region. 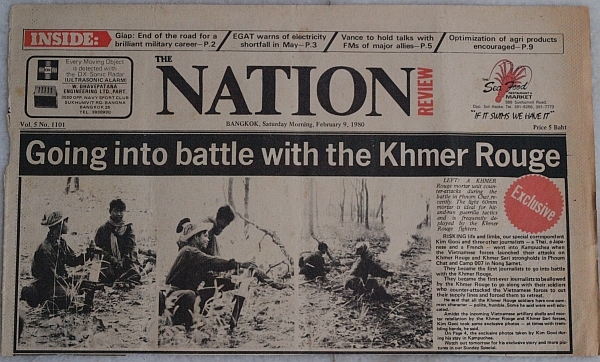 His rare footage of the trip has been widely sought by research scholars studying the Kampuchean conflict. Says Naoki, “There is no greater fear in life than fear of your own mind or imagination.” Naoki has traveled three times round the world working as a still photographer and writer. Mabuchi’s ten-week-long foray into the Vietnamese-controlled Tonle Sap region with the Khmer Rouge in 1983 was thought to be a sensational scoop at the time, but it caused him chronic hepatitis, which complicated his health from then on. More danger was to follow. While making a documentary on the Vietnamese-Cambodian border, the Vietnamese hotel the crew were staying burnt down, killing a dozen guests including one of Mabuchi’s Japanese crew. Mabuchi said he survived because he crawled on all fours, nostrils just above the floor like a ‘Ninja’, because that is where the oxygen layers lie. Despite that his lungs were badly damaged and he lost his voice for weeks. He spoke with a rasp the rest of his life. – Shortly after the fire, colleagues John Hail, Ing K and I visited Naoki at Bangkok’s Samitthevit Hospital. He had just been been flown in from Ho Chi Minh City and was barely alive. He was hooked up with tubes and beeping breathing apparatus. He couldn’t talk, but wrote notes to us and clearly retained his optimism and his will to live. In September 2006 he published his long-awaited book in Tokyo. The title, loosely translated from the Japanese: “Pol Pot – I Saw the Life Running Through the Killing Fields”. His later years were beset with health problems mainly as a result of his injuries, complicated by kidney failure, diabetes and failing eyesight. With his energy waning, Mabuchi spent a lot of time in his final year at his mother’s house in Tokyo, researching Khmer history and culture and its relationship with Japan. In between he visited used book shops in Tokyo assisted by his daughter, Nungruthai Hirona, from his second marriage to his Khmer-Thai wife, Ell. His body was found in a hot bathtub at his favourite public spa near the family home in Tokyo. Mabuchi is survived by his daughter Wattana (named after the town of Wattana Nakorn near the Thai-cambodian border) from his first marriage to Chinese-Khmer, Sayhong, who was with him in Phnom Penh’s French Embassy in 1975. From his second marriage: son Donniie Kumemaro and daughter Nungruthai Hirona. They and their mum Ell live in Bangkok. 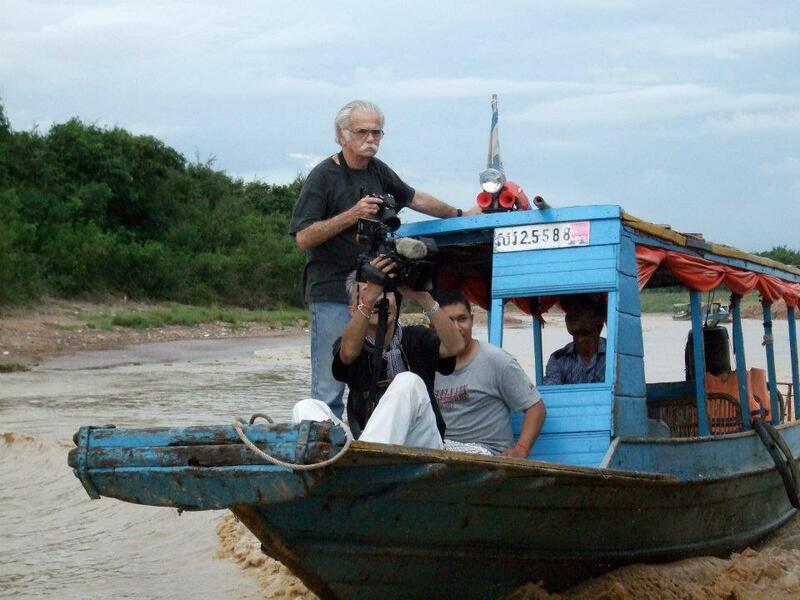 On May 8, 2012, Mabuchi’s ashes were brought from Tokyo to Tonle Sap and scattered into the placid waters. About 30 family members and close friends attended , among them Sayhong and legendary photographer Al Rockoff.